But if I deploy my web application on Tomcat 6, I need to specify the context root. Well this is no good, why will the users of this website be willing to remember the context root. What if the context root changes. In other words the users would not be interest in typing the following - http://www.mydomain.com/myappcontext to visit this site. Hence it is necessary that I change the default / root web application of Tomcat and point it to my application. I wanted to try and test this on localhost first. As always I Googled and found a number of posts and none seem to work. I also read the documentation it was helpful in understanding the concepts but was not effective as I could not get it working. Finally after few hours of trial and error one of my colleague Joyeeta Majumdar found the solution. Here it is step by step account. 2> Create a folder <engine>/<hostname>. In my case - Catalina\localhost. This folder is created under <Tomcat_Home>/conf. In my case this is C:\tomcat6\conf. 3> Create a file named ROOT.xml (case-sensitive) in the C:\tomcat6\conf\Catalina\localhost folder. You will need to change the docBase attribute to the location of the exploded web application. No changes to be made either in server.xml or context.xml located in c:\tomcat6\conf folder. Now try http://localhost:8080/ and it should take us to Jing-Web application. You may need to delete the contents of your browser cache(press F5) to view the changes. You may also need to delete the contents of <Tomcat_Home>/work directory to get this working. The operation that I intend to carry out is depicted in Figure 1. Step 1 - Create the message listener. Finally you can see the results of message produced and consumed in the Admin web console as shown in Figure 2. 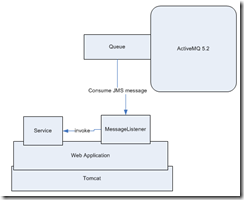 In this post, I will show how you can send JMS message to ActiveMQ from your Spring web application. 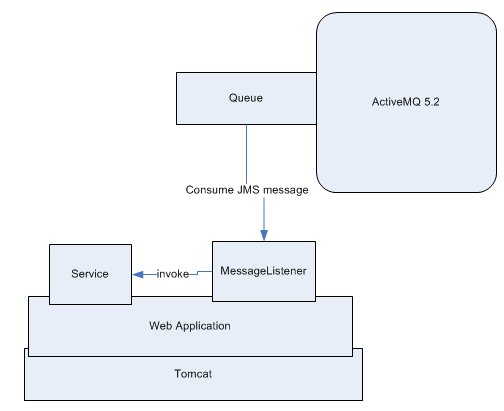 I have a Spring 2.5 + JBOSS Richfaces based web application that runs on Tomcat 6 running on JDK 5. Figure 1. depicts what I intend to do. 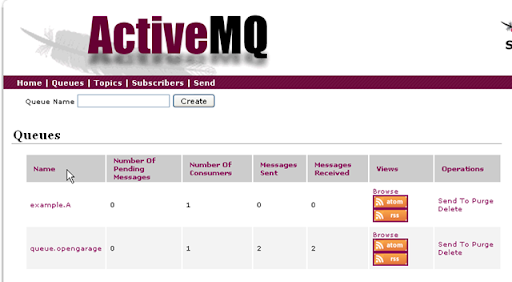 Step 2: Create the destination/Queue using the ActiveMQ admin web application. Click on 'Queues' to navigate to queue list and create screen. You will need to supply the queue name and click on 'Create' to create a new queue destination on ActiveMQ server. This is shown in Figure 3. Step 3. Create a message producer interface. This may not be necessary, but since I prefer to implement Program to Interface in my application I define a message producer interface. This interface defines a single method(can have more, but for now this will suffice) which accepts an object (Java bean) which will be passed to the Queue. This class is responsible for sending a particular JavaBean object to the queue (your goal may be different / may want to send something different). The key is the send method. It uses a MessageCreator to consume the supplied Event object. It then uses the JmsTemplate to send this message to the destination. Now we need a client to use the message producer. The Event business service class will use this message producer. Step 8 - Configure in Spring application context. The message producer is injected by the Spring framework. Here is the configuration snippet from the service configuration. Finally I restart my Tomcat when everything is ready, launch the event entry form, fill in data and click on Send button in the screen. The event details are now in the queue. 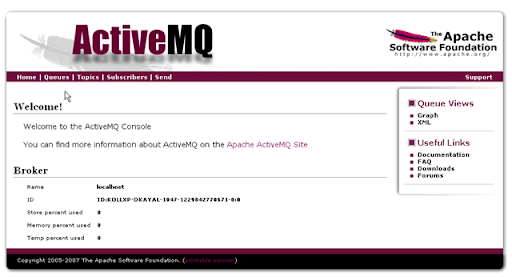 You can test this in the ActiveMQ admin web console as shown in the Figure - 4 below. Figure 4 - New message now in the Queue.